Every fashionista knows Uggs shoes are a must-have for the chilly weather season because they serve up major comfort while keeping our feet stylishly snug. While there are days that Mother Nature eases up with unseasonably warm temps, it’s always smart to keep a stylish, lightweight pair on standby. 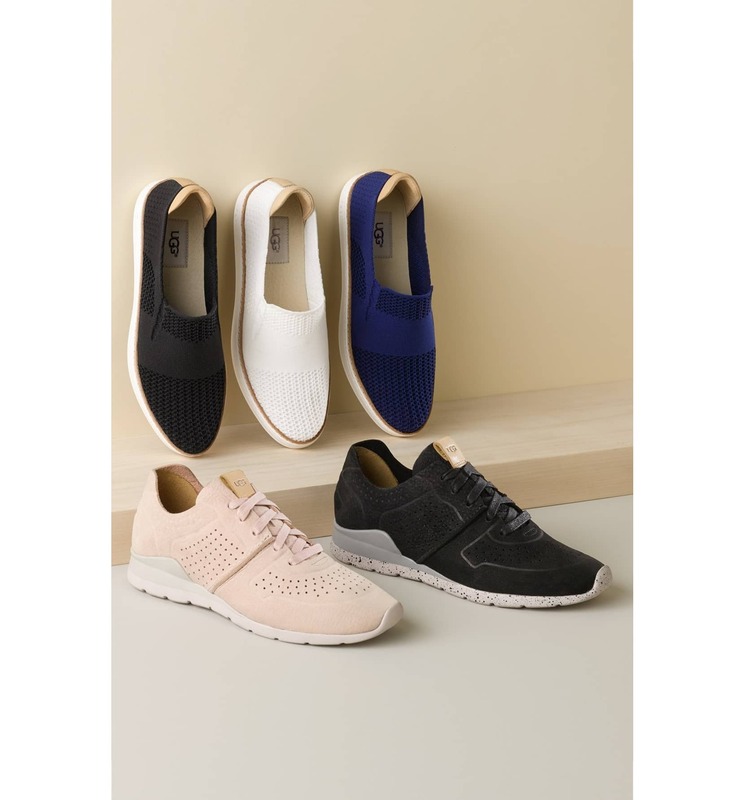 At Shop With Us, we’ve been on the hunt for sneakers that are equal parts stylish and comfy and the choice was pretty simple once we spied these Ugg suede sneakers on sale at Zappos with an extra special discount. Today only, shoppers who spend $100 or more will receive a code for $20 off a future purchase, which means we may be able to get everything on our wish list this season. See It: Grab the Ugg Tye Sneaker at Zappos for up to 43 percent off the original price of $140, starting at $80 in chili pepper, drizzle, quartz, black and tideline while they’re still in stock. The Ugg Tye Sneaker blends comfy flair with up-to-date styling for a trendy essential we’ll never want to take off! Designed with a soft nubuck leather, these kicks offer a luxe, yet polished finish that will easily take our ensembles to the next level. Crafted with embossing and perforated detailing, we love that these sneakers serve up edgy street style for the perfect finishing touch to any look. Made with molded PU lined insole, this beautifully crafted offering offers the maximum level of comfort for a seamless wear all day long. We also love that the outsole is made with Ugg’s signature Treadlite technology that provides increased traction and durability for a sturdy wear on almost all surfaces. With the ability to provide top-of-the-line cushioning and flexibility, these kicks have redefined the way we look at sneakers! Complete with a lace-up closure and a super lightweight feel, this creation will keep us moving in style. Available in a wide range of colors including earthy hues and vibrant shades, these sneakers will make the perfect addition to any wardrobe. Personally, we can’t resist a hue that’s versatile in nature and the Tideline tone is just the ticket! Providing a mix of rich brown and tan shades, this style is the perfect substitute for our go-to pair. We can also welcome more neutrals into the fold with the Drizzle hue. Boasting a cool tan shade with a touch of grey, these shoes will come right in handy for our year-round style. For those who love to play with color, the Chili Pepper style is just the ticket. Showcasing a chic muted red, these kicks will give our everyday outfits the pop of color we need. The Quartz style is also a smart choice for fashionistas who like stepping out with pastel tones. A gorgeous blend of salmon and flamingo pinks, this design will add a feminine touch we know and love. Normally retailing for $140, we were excited to see a jaw-dropping markdown up to 43 percent off, which gives these sneakers a starting price of $80! Budget-friendly and effortlessly stylish, it feels good to know that we don’t have to spend a fortune on a fabulous essential. We never miss an opportunity to step out in style and we plan on wearing these suede sneakers with boyfriend jeans, an oversized sweater, a top coat and a satchel for a winter-ready look. For days when we’re running errands, we’re pulling out track pants, a long sleeve tee, a longline fleece jean jacket and a tote bag for a no-fuss ensemble. Thinking of a night out on the town look? We’re wearing a black mididress, a moto leather jacket, a cross-body bag and a bold lip for good measure. Looking to bring your athleisure style to life? We’re teaming this essential with leggings, a crewneck sweater, a midicoat and a backpack for a relaxed style. Whether we’re ready to hit the streets with a casual look or a dressy ensemble, these sneakers will definitely go the distance with any wardrobe. Zappos shoppers are equally impressed! Many reviewers love that this suede leather offering is gentle on the feet, while others adore its lightweight and airy feel. One reviewer noted that these sneakers are so “airy,” it’s as if you’re walking on a cloud. Sign us up! Shoppers also dig that there is a lot of cushioning in the soles, while others like that they look great with almost any outfit. Many reviewers also love that this design is versatile enough for the office and stylish enough for our casual attire. Dubbed as the perfect walking shoes, you can bet that we already have each style in our shopping carts. Available in sizes 5 to 12, now is a great time to take advantage of this red-hot deal! With the holiday season officially in full swing, this style will make for the perfect gift for yourself or your loved ones! See It: Grab the Ugg Tye Sneaker at Zappos for up to 43 percent off the original price of $140, starting at $80 in chili pepper, drizzle, quartz, black and tideline while it’s still in stock.